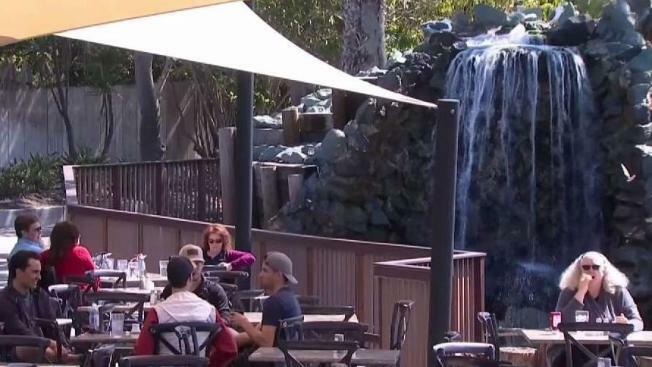 A restaurant along the water at a San Diego resort was slapped with a $34,500 fine to settle a lawsuit filed by the city attorney’s office after the eatery – despite a warning – continued to charge customers a hidden fee. City Attorney Mara Elliott’s office confirmed Friday that Barefoot Bar & Grill – a Mission Bay restaurant located inside Paradise Point Resort on Vacation Road – had agreed to pay the hefty fine after failing to clearly disclose that it was adding a 3 percent surcharge to customers’ tabs. The city attorney’s office said the eatery was one of more than 11 restaurants to receive a warning letter from Elliott after the businesses began adding the surcharge without properly disclosing the practice to patrons. 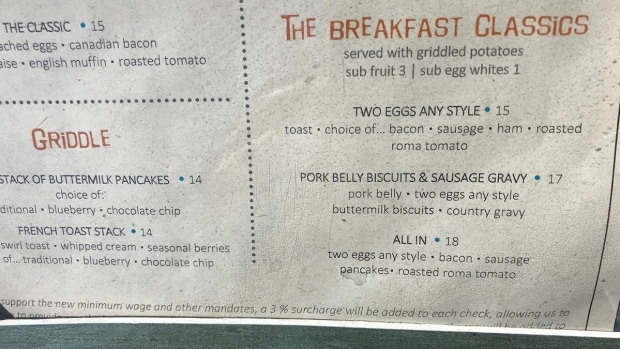 A photo of the menu at Barefoot Bar & Grill indicates, in small print at the bottom, that a 3 percent surcharge will be added to the tab. Elliott’s office alleged the hidden surcharge was a violation of California’s False Advertising and Unfair Competition Law. Under the state’s Business and Professions Code, it’s illegal to make false or misleading statements in advertising, and Elliott’s office argued that failure to disclose a surcharge on the cost of items on restaurant menus violates this law. “If they are going to charge a surcharge, make that clear and conspicuous, as big a print as the price itself,” Deputy City Attorney Mark Ankcorn told NBC 7. Elliott said the other restaurants heeded the warning from her office and changed their practices. However, Barefoot Bar & Grill did not, and continued with the hidden surcharge. The surprise came at the end of a meal when customers received their bill. The city attorney’s office said it began getting consumer complaints of this hidden surcharge practice at some San Diego restaurants in 2017, after the minimum wage hike. Some eateries claimed the surcharges were “government mandated” when, in reality, they were not. Some restaurants also claimed the increase in minimum wage was hurting their business, prompting them to raise prices on menus and lay off staffers. Elliott said she would crack down on restaurants for the surcharge issue, and her office began serving warning letters to businesses. Most restaurants began appropriately disclosing the fees to customers or stopped adding the surcharge altogether. In November 2017, private lawsuits were filed against local restaurants also alleging surcharges violated laws meant to protect consumers from false advertising. The California Restaurant Association called the lawsuits nothing more than a shakedown. At that time, Elliott’s office had already filed for legal action against Barefoot Bar & Grill. NBC 7 reached out to Barefoot Bar & Grill for comment on this case but the restaurant has not yet responded. The restaurant is frequented by tourists and NBC 7 spoke with some people in the area Friday about the case. Many agreed the surcharge should be clearly communicated to customers. “You should be aware of it ahead of time before, or it should be on the menu so you have the option to decide whether you want to eat there or not,” said Philadelphia resident Christine Iuliano. “I think if I would see a surcharge on there, I may not tip as much as I normally would,” New Mexico resident Sam Trujillo told NBC 7. “I would say, probably, it would be good to have it when you walk in the door -- we charge X surcharge before you even order your meal,” added Colorado resident Bruce Osmond. The city attorney’s office plans to continue keeping a watchful eye over the restaurant surcharge issue. Any consumers who believe they may have been victims of false advertising can call (619) 533-5800.